Robertson has created an engrossing, hugely ambitious, but delightfully satisfying novel which is a pleasure to read from beginning to end. As Scotland moves towards a vote to decide on Independence it should be required reading for anyone who wants to know what it means to be Scottish. This book will not be for everyone but if you are looking for something a little different from the supermarket sold, formulaic fiction currently proliferating bookshops bookshelves, give this debut author a go. Bissett has captured superbly what it’s like to be a teenager. For those of us (thankfully?) past those years it’s a wonderful reminder of what it felt like to be free, up for it and yet petrified of the unknown. For the teenagers of today it will be reassuring to read that they maybe aren’t that different after all. This book is much more than a novel about a fan’s trip to see his team play football. It will make you laugh, make you think and when you reach the last page you will hope it’s not the last time you encounter Alvin and the boys from Falkirk. Book summary (taken from Amazon UK: Diagnosed with Stage IV thyroid cancer at 12, Hazel was prepared to die until, at 14, a medical miracle shrunk the tumours in her lungs… for now. Two years post-miracle, sixteen-year-old Hazel is post-everything else, too post-high school, post-friends and post-normalcy. And even though she could live for a long time (whatever that means) Hazel lives tethered to an oxygen tank, the tumours tenuously kept at bay with a constant chemical assault. Enter Augustus Waters. A match made at cancer kid support group, Augustus is gorgeous, in remission, and shockingly, to her interested in Hazel. Being with Augustus is both an unexpected destination and a long-needed journey, pushing Hazel to re-examine how sickness and health, life and death, will define her and the legacy that everyone leaves behind. 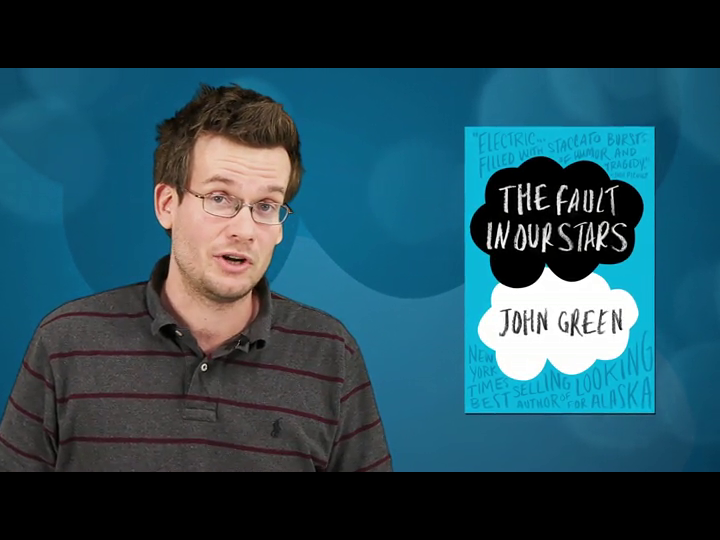 John Green and his band of ‘nerdfighters’ are something of a Internet phenomenon. Colonising websites, blogs and twitter with the #DFTBA acronym (Google it if you don’t know what it means)they are quite a force of nature. The fact that Green’s books have not yet been published in the UK, yet they still have an army of fans is proof of the power of Greens online presence. In fact it was through the constant excited tweeting from some of his UK fans that ‘The Fault in Our Stars’ came to my attention. Librarian colleagues, unable to believe I hadn’t read any of John Green’s previous novels told me, “I had to read this book”. I now echo what those colleagues told me. You have to read this book. This is a wonderfully written, heart-wrenchingly sad, yet at times gloriously funny book. When writing about such an emotive subject as Cancer in teenagers it would be easy to fill a book with stereotypes and cliches. However this novel is quite the opposite and Green should be commended with the approach he has taken to writing a novel on this subject. From the first moment we meet Hazel, describing the Cancer support group her parents insist she attends, we are engaged with her. She’s smart, funny, and although she’s dying from Cancer, the last thing she wants is for us to feel sorry for her. It’s at the support group that Hazel meets the enigmatic Augustus. Arrogant and self-assured, Augustus is in remission, is in Hazel’s eyes gorgeous, and to Hazel’s surprise, is interested in her. The journey that Hazel and Augustus take from this moment on will envelope you as you watch their fledgling relationship develop into a beautiful romance. Trying desperately to do everything any other teenagers in a relationship would do, and yet at the same time coping with the pressures and demands of living with cancer is evoked wonderfully by Green. Green does not want us to feel sorry for Hazel and Augustus, rather he wants us to see them for what they are, two teenagers experiencing love for the first time. For anyone who has suffered the effects of cancer this must be a battle they face every day – for people to see them as themselves not as someone who is fighting to stay alive. This book is much more than a book about Cancer. It’s a book about death, love, relationships and how we feel about all of these things. The characters in the book are real and we are invested in them from the 1st page. The fact that they are dealing with something which is heart-breakingly sad only makes us care about them more. There can be few books who take the themes of this novel and deal with them in such a sensitive yet real and unimagined way. Teenagers everywhere (including boys as this is not a slushy chick lit romance) should read this book. In fact let’s not stop at the teenagers. Everyone should read this book, it’s exceptional and will make you think about life, love and death. Every step of Saba’s journey sizzles with danger… In a lawless land, where life is cheap and survival is hard, Saba has been brought up in isolated Silverlake. She never sees the dangers of the destructive society outside. When her twin brother is snatched by mysterious black-robed riders, she sets out on an epic quest to rescue him. The story’s searing pace, its spare style, the excitement of its fabulously damaged world, its unforgettably vivid characters, its violent action and glorious love story make this a truly sensational YA debut novel. This is Moira Young’s debut novel and what an entrance to the world of young adult literature she has made. ‘Blood Red Road’ is a relentless adventure which will grip you from beginning to end and will leave you counting the days until the sequel is released. The story revolves around Saba trying to find her brother, Lugh, taken from their family home by mysterious men on horseback. Saba’s quest takes place in a dystopian world which Young has vividly created. There are elements of our world and yet so much is different. Cities are now concrete jungles and new species roam the barren wastelands, ready to pounce on unsuspecting souls. The book moves at an exhilarating pace as Young pushes Saba ever onwards on her quest. Accompanied by younger sister Emmi, Saba endures many challenges including a period where she is a competitor in a’Hunger Games'(fellow dystopian novel) style cage fighting event. It is within the walls of the cage fighting arena that Saba discovers Jack who joins the two sisters in their desperate search for Lugh. The three of them all play their part in the books exciting final chapters. Saba is one of the many reasons you will love this book. Feisty, fearless and yet at times fragile she leads you through Young’s desolate landscape with no fear. Jack although arrogant and cocky still comes across as a likeable guy and the love/hate relationship which develops between him and Saba is an enjoyable plot development. Almost stealing the show from Saba is her pet crow, Nero. Never has there been a more unorthodox yet instantly likeable hero in a book! A constant confidant for Saba, Nero allows us to see what Saba is really thinking as she continues on her journey. Young has written the book in the first person in the style of, what I presume, is Saba’s Western accent. There is also no speech punctuation and although some may find this tricky it didn’t spoil my enjoyment of the book. Blood Red Road is an epic adventure story which will transport you to a near future which will scare you, yet excite you at the same time. Reminiscent at times of Patrick Ness and Suzanne Collins yet still full of originality Young has written a book which you will be sure to enjoy. In a ruined future, an extraordinary artefact from the past lies buried. Everyone wants it. But why? What is it? And how can it save them all? For scavs Cass and Wilbur, slaving to dig it up, there are no answers. But when two strangers from another time turn up claiming to know about the lost relic, their world will change for ever. Six Days. If you thought you knew how the world began … think again. ‘Six Days’ is set in a future London which we are to assume has been involved in a major war involving bio-chemical weapons. Not all human life has been destroyed though and the survivors are the ‘Scavs’ controlled by the oppressors the Vlad’s (New Russians?). Scavs must spend each day searching for an artefact, yet no one has ever seen it or even knows what it looks like. This young adult book crosses both the dystopian and science fiction genres but at it’s heart it is very much an adventure story. Although slow to start the pace picks up after the first few chapters when we realise that Cass and Wilbur only have six days to accomplish their mission. As the time slowly ticks down on Cass’ wrist the tension mounts. Cass and Wilbur, both Scavs, are the two main characters with Cass being instantly likeable. She is gutsy, courageous and intelligent , whilst at all times protecting her younger brother Wilbur. The relationship between Cass and Wilbur is one of the main threads running through the book and Webb expresses the thoughts of each sibling to the other expertly. Although our main protagonist Cass is a girl, boys will enjoy the Science Fiction elements of the novel. As the story progresses it becomes much more of a Science Fiction adventure as we meet beings from other worlds, travel into space and encounter the strange part machine-part human ‘Okhotniks’. As a debut novel there is lots to enjoy here and I was pleased that what I thought was going to be another dystopian fiction novel actually developed into something a little more interesting. Webb has written a story that although a little bit of a slow burner will engage you if you give it time. Once hooked you will enjoy the engaging characters, the clever plot and most enjoyable of all, Webb’s wonderful imagination. I think it’s safe to say the Fleming Estate will be delighted with the sequel that Boyce has written to the original ‘Chitty Chitty Bang Bang”. This is a wonderfully entertaining, fun filled, enjoyable story which boys in the later stages of Primary school will love. The book centres around the Tooting Family and their adventures in a VW Camper Van. The van is fitted with an old engine rescued from a rather peculiar scrapyard and it soon becomes clear this engine has transformed the camper van into something rather extraordinary. Before too long the Tootings discover their camper van has a mind of its own and their magical mystery tour begins. Boyce enthralls us with the various escapdes of the Tootings and Chitty as they travel across the English channel, onwards to Paris and then beyond to the African Continent. The story is pacy, entertaining and laced with humour throughout. As we arrive in each destination we are given snippets of factual information which adds another interesting angle to the story. The family themselves have been expertley created by Boyce. They are a very modern family, with a father recently made redundant (a nod to the current recession? ), a mother trying to hold things together, Lucy the Goth teenager, and her brother Jem, and not forgetting little brother Harry. All of the characters are engaging, the dialogue between them feels natural and Boyce makes reference to various modern day issues affecting families. Boyce has written a great book which firmly transplants Chitty, Chitty Bang Bang into the 21st Century. It’s full of fun, adventure, mystery and suspense and the ending leaves us in no doubt that the Tooting family adventures are far from over. I look forward to catching up with them and Chitty Chitty Bang Bang again soon!